These gorgeous tumble stones belong to the Titanium Aura group of stones. That is to say that the precious metal used in these Sunset Aura Quartz is predominantly Titanium, although sometimes small amounts of other rare metals such as Gold, Niobium or Platinum may be added to further enhance or develop the colour. Recently discovered subtleties in the process such as, how much Titanium is used, how long the pieces are treated for, the exact temperature reached during the process and, quite importantly, how the stones are subsequently cooled, now make it possible to create many bright and vibrant pieces like these. It is however, impossible to say the exact way these gorgeous pieces are created though as the creators in the USA are paranoid that manufacturers in other countries will discover their secret and mass market cheap copies worldwide. For this reason, the exact formula and process are kept a closely guarded secret ! 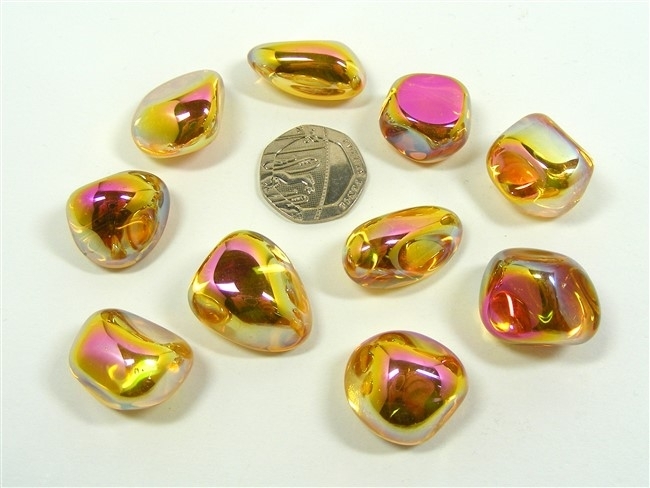 So enough of the technical stuff - these are super lovely stones with a gorgeous colour and if you like Aura Quartz then Sunset Aura is one that you will definitely not want to be without. Do please note that these stones tend to have small surface imperfections, tiny impact marks, rubbing marks, marks that look like scratching etc. You'll have to look to see these, but we're just letting you know they are there if you look close enough. 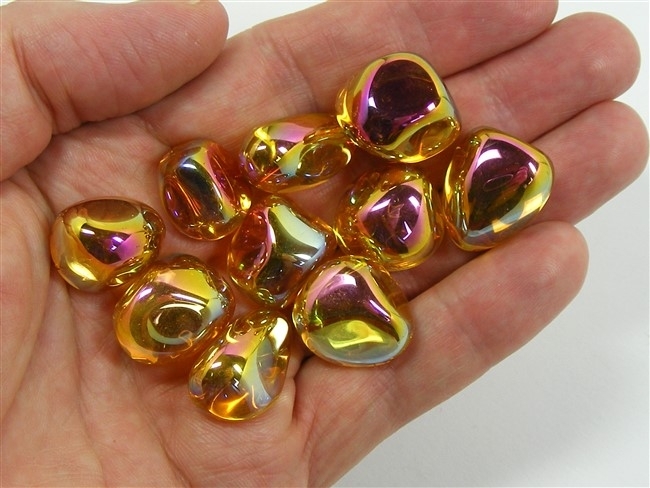 Sunset Aura Quartz, is clear Quartz that has been treated with Titanium and possibly other rare metals in order to create its magnificent yellow and pink colouring. It is believed to be beneficial when we are suffering from fatigue. Sunset Aura Quartz helps us to release past resentments and grief. It helps us to free ourselves from negative emotions that are holding us back and preventing us from moving forward. It is also said to help with dysfunctional relationships. Sunset Aura Quartz can help us to experience deeper insights into life and living and enables us simply enjoy the whole process of living and being alive ! Sunset Aura Quartz fills our energy field with bright vibrant colours and helps us to better connect with the higher spiritual realms and with our own spiritual guides. It helps to open psychic channels and enhances our clairvoyant, clairaudient and clairsentient abilities. In meditation Sunset Aura Quartz can help to raise our kundalini energy from our base chakra to our crown chakra helping to align all our other chakra points in the process. It protects us from any negative energies that may surround us and brings more positive energy into our Auric field which helps us to raise our own personal vibration.